Burle Marx and two associates designed the landscape for Caracas, Venezula’s large Parque del Este. The fountain and brilliantly colored native trees here are part of the 200 acre park. Photo by Owen Forever/Wikimedia Commons/CC-by-4.0. Both an ecologist and an artist, Burle Marx approached landscape architecture holistically, balancing concerns such as color, shape with the plant’s natural requirements and how they interact with the environment. For instance, rather than mixing various plants together like a European cottage garden, Burle Marx grouped one type of plant into a sculptural block, which allowed the plants to thrive and created a strong visual impression. 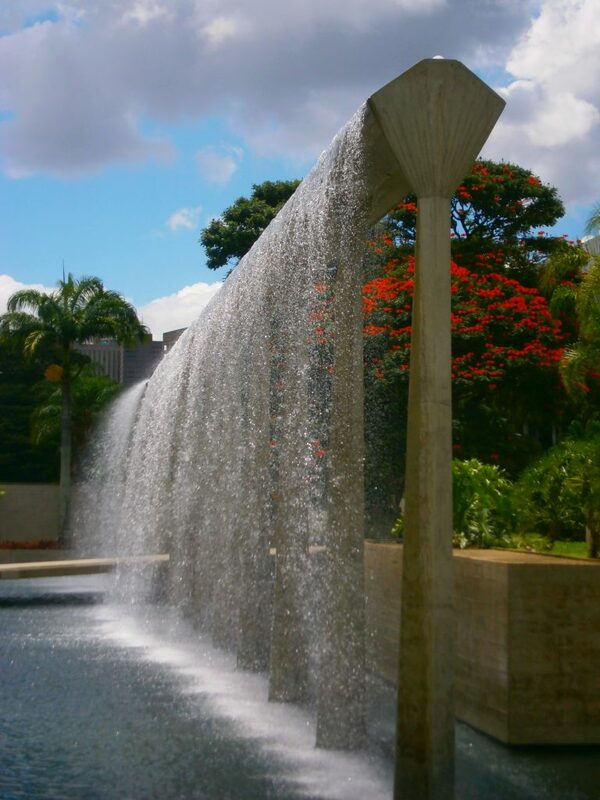 The water and sculptural groups of plants outside the Itamaraty Palace in Brasilia both reflect and soften the concrete, linear structure. Photo by Ana de Oliveira/AIG-MRE/Flickr Commons/CC-by-2.0. From private residences to public spaces, mainly in Brazil, but also in Venezuela and farther afield in Malaysia and the US, Burle Marx’s prolific career drew attention to the riches of Brazil’s tropical natural diversity and the possibilities of landscape shaped by both place and modern artistic sensibilities. His former private residence and gardens, Sítio Burle Marx, is under consideration as UNESCO World Heritage Site.